Even if you don’t do it yourself, you probably know at least one person who sees the word, “fragile” and goes on to loudly pronounce it “fra-gee-LAY.” Such is the ubiquitous influence of the nostalgic 1984 film, A Christmas Story. So, in the spirit of the season, we thought we’d shoehorn the movie into a newsletter article. Fortunately for our purposes, many scenes from A Christmas Story truly can teach business owners and managers something about effective marketing. Don’t waste effort on the wrong audience. Young Ralphie wants a Red Ryder BB gun for Christmas. Most of the movie is centered on him trying to persuade certain people that he should have one. But consider the targets of his messaging: his overly protective mother (remember how she dresses her youngest son for outdoors? ); a school teacher who was most concerned that her students keep nice margins; and an overworked department-store Santa. None of these people were going to be a receptive audience to Raphie’s message. How you express yourself does matter. Sometimes we say, “Fudge!” (only we don’t say “fudge”). When this happens, we can turn customers off or even get a hostile reaction. This is especially true in today’s hypersensitive, PC world. Always carefully craft your marketing communications to accomplish an objective rather than rashly blurting out something counterproductive. Keep in mind that social media can be especially dangerous because of the speed at which communications are spread. Some brands are recognized as leaving a bad taste in your mouth. If you think brand ID doesn’t carry weight, consider Raphie’s concern about which bar soap his mother would use to wash his mouth out (Palmolive’s “nice piquant” vs. Lifebuoy potentially causing him to go blind). No business can do much if its products and services are used in an improper manner, but you can be vigilant as to how your brand is perceived by the public and do everything possible to protect and enhance its image. Rethink showing off that “major award.” It’s easy to be distracted about what aspect of your business should be front and center in your marketing communications. If some new development at your company doesn’t support your brand and validate your value proposition, it probably isn’t worth publicizing … and making a big deal of it could cause you to look silly, like the leg lamp does for Ralphie’s father. Following the crowd can leave you stuck all alone. What your company excels at doing may not be the same thing that your competitors do well. (In fact, it’s better if you’re unique!) Don’t let yourself be “triple-dog-dared” into abandoning your true value proposition because you think you need to be all things to all people. “Me too” is never a compelling message; stick to communicating what you do best or you’ll find yourself abandoned in the cold. Be true to yourself. Don’t let the expectations of others force you into a ridiculous bunny costume—figuratively speaking … or literally. 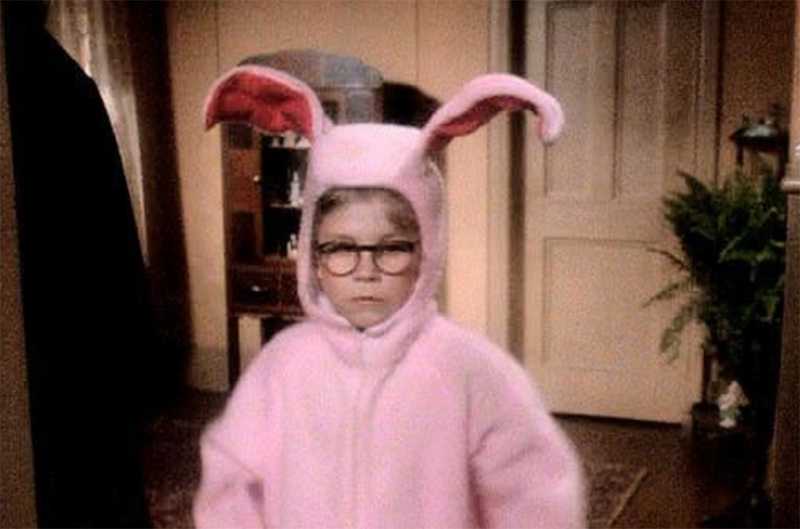 Remember Ralphie’s bunny costume, a gift from his aunt? He looked and felt ridiculous. If you can’t sell what you’re offering and be yourself doing it, then you should probably be in another business. As a business owner, incorporate your personal style into your brand to help make it special. If you do good work, you’ll find your niche—and you’ll have a lot more fun. Know what you really want. Most business owners know they should do “marketing.” As a result, they may sit down with an agency or their in-house marketing staff to create a campaign. At some point, someone should pose the question as to what the objective is. This requires identifying a promising target audience, setting tangible goals so that success can be measured, and then coming up with a step-by-step plan. Anything less, and you may as well mumble that you want a football. Poor Ralphie had to say something to Santa. You really could “shoot your eye out.” That didn’t quite happen to Ralphie but he did end up with broken glasses. Just think about it. If you’re paying people to market your business—and they presumably know more about marketing than you—why would you ignore their advice? That’s like going to a doctor and then prescribing your own treatment. Be open to new ideas. Sometimes the neighbor’s dogs eat the Christmas turkey and you must come up with an alternative plan. When such things happen, Plan B may turn out better than you ever expected—like roast duck at a Chinese restaurant. Why wait until a disaster strikes to try something new and innovative? If you’re consistent with your brand, properly target your audience, and can deliver a compelling message, try something different! We can help you navigate these 10 lessons – just let us know how by dropping a line here.